Improve your fighting prowess with new cards for enhancing your combat lifestyle. 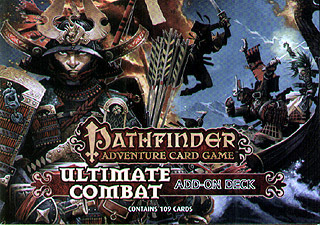 Chock full of enough armours and weapons for any war you might wage, the Ultimate Combat Add-On Deck can be used with any Pathfinder Adventure Card Game character or Adventure Path. Or you can play with the brand-new character included in this 109-card box: Hayato, the iconic samurai. Get ready for action with the Ultimate Combat Add-On Deck!